Designs by Lisa Somerville: Vintage Baby! I stopped over at CPS to take a look at this weeks sketch, and used it as my jumping point to create today's card. I had posted this Pink Baby card recently, and decided to create a blue one. One of my new favorite papers is the Bella Blue - I love the vintage feel of the papers, and thought it would be the perfect background paper for my card. 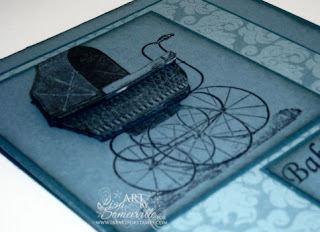 As in the pink card, I stamped the Antique Buggy image 3 times on Buckaroo Blue card stock in black ink, placed my main panel on a piece of Not Quite Navy, then cut out the buggy and popped it up with dimensionals. I then cut out another area of the buggy and popped it up on the panel. 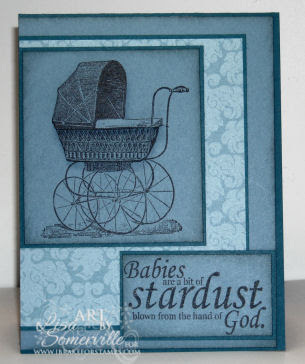 The sentiment is also stamped in Black on Buckaroo Blue, then layered on a piece of Not Quite Navy. Love it, Lisa! The Bella Bleu paper is perfect! Beautiful! Love the layered look! WOW! This card is very pretty! I love this! That little buggy is absolutely adorable! This is wonderful...love the baby buggy! Great job with sketch 104...thanks for playing at CPS this week! The blues are wonderful, that buggy is adorable and great use of the CPS sketch! Pretty baby card! love that vintage carriage! This looks great. I really like the way you added the 3D look. Thanks for joining us at CPS! !